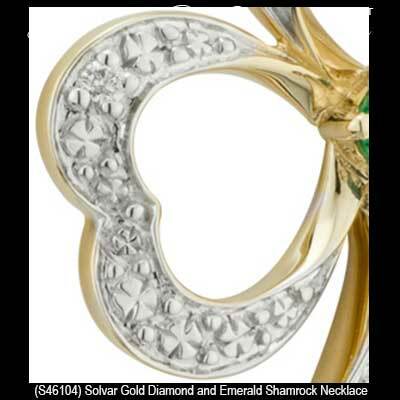 Shamrock necklace features 14K gold construction along with a center emerald and diamond accented leaves. This gold shamrock necklace has been hall marked by the Irish Assay Office at Dublin Castle. 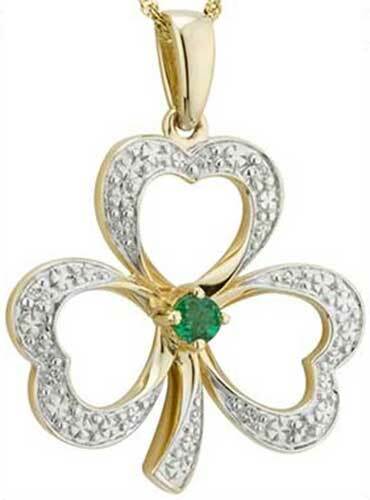 This 14K yellow gold shamrock pendant features a 2.5mm emerald in the center along with a single diamond in each of the white gold accented leaves for a 0.02ct. total diamond weight. The emerald shamrock necklace measures 5/8” wide x 7/8" tall, including the jump ring and the chain bail; an 18" long 14K gold chain is also included. 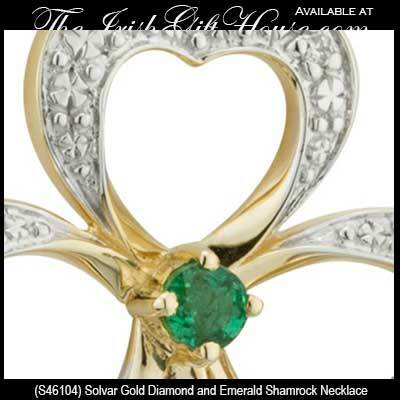 The Irish necklace is made by Solvar Jewelry in Dublin, Ireland and it is gift boxed with a shamrock history card, complements of The Irish Gift House. Shamrock earrings feature 14K gold construction along with center emeralds and diamond accented leaves. Shamrock necklace features 14K white gold construction along with a center emerald and diamond accented leaves. Shamrock earrings feature 14K white gold construction along with center emeralds and diamond accented leaves.